Heriot’s cemented a BT Premiership top-four finish and increased the possibility of securing a home play-off match when they defeated Stirling County 31-13 at Goldenacre. The champions fell behind to a first-minute touchdown, but bounced back with tries from Tom Wilson and skipper Jack Turley, both converted by John Semple, which gave the Capital side a 14-8 lead at the interval after Stirling had closed the first half scoring with a penalty. Wilson bagged a second score and Charlie Simpson dotted down for the bonus point, then Gregor McNeish slotted a drop goal to complete the win. The visitors had the final word with a second unconverted try, but that was of little consequence for Heriot’s, whose five-point haul has moved them into second place in the league table, although they could be overhauled by Currie should the Malleny Park men beat Gala in their remaining fixture. 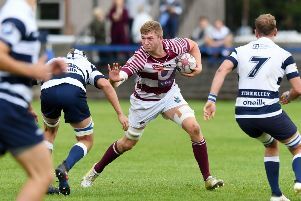 BT National Division One pacesetters Watsonians missed out on the chance to stretch their points advantage over the pursuers into double figures when they were edged out by Marr in the top of the table clash. A late penalty gave the Ayrshire outfit a 9-8 victory that means Sonians are just five points clear with five matches to play. Edinburgh Accies bounced back from the previous week’s cup exit to post a 22-18 win at Aberdeen Grammar. Greg Campbell, Callum Black and Alex Glashan had a try apiece to keep Accies fifth in the table. Stewart’s Melville also had a successful trip, with Mike Hanning booting a late penalty in an 11-10 victory at GHA. Haddington have slipped to third spot in Division Three after going down 14-12 away to Orkney. The East Lothian men had a long trip by bus and plane to face the islanders. However, they were quickly into their stride, with James Ferguson touching down and Gareth Pritchard converting for a 7-3 lead after 20 minutes. But the hosts fought back to take the win, while Haddington’s narrow defeat bonus was not enough to prevent them surrendering second spot in the table to West of Scotland. RHC Cougars posted a second successive win, following up last week’s BT Cup victory with a 38-13 result at Irvine. Meanwhile, cup holders Boroughmuir bowed out of the competition when they went down 23-14 at home to Hawick, the side Muir beat in last year’s final.